Find a point of sale in your area. 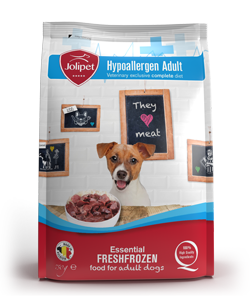 Complete top-quality food for adult dogs, based on a unique source of protein formulated in conjunction with university researchers. 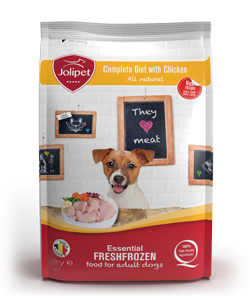 High-quality ingredients promote maximum digestibility. 50% horse meat, obtained from the de-rinding of horse meat for human consumption. 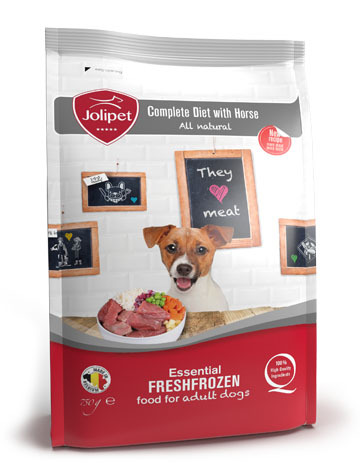 Horse meat is one of the healthiest meat types. It is lean, contains a lot of iron and is rich in vitamin B. Fresh frozen apple, source of natural vitamins. Vegetable oils and fats provide the ideal omega-6/-3 ratio. 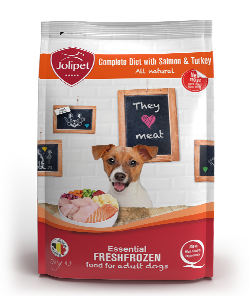 Thanks to our ongoing co-operation with university researchers our recipes are based on the latest scientific research into pet nutrition. 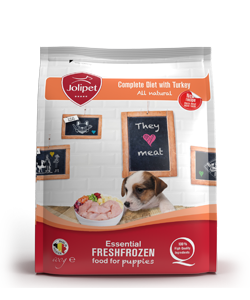 In addition, our recipes contain other vitamins and minerals, optimally meeting the needs of your pet. 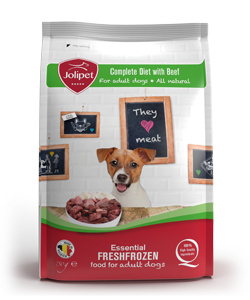 These recommended daily amounts are only a guideline, because the needs of dogs vary. 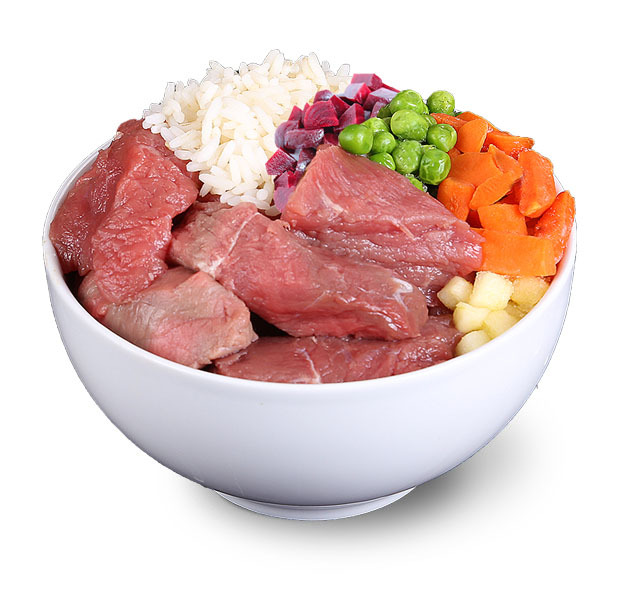 Therefore, adjust the amount of food to maintain ideal body weight. Always provide fresh drinking water. 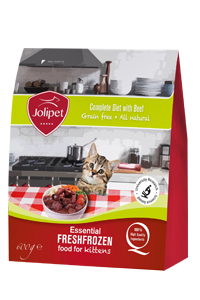 This guideline also assumes that your dog eats nothing else than this food. 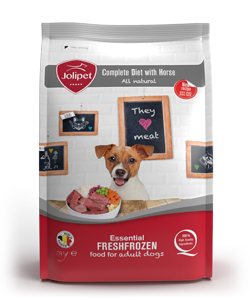 If your dog gets snacks or other food on a daily basis, you need to lower the recommended daily quantity. 1 The target weight of your dog is its ideal weight (score 4-5 in the body condition system), i.e. you can easily feel its ribs without feeling any fat, its waist is clearly visible behind the ribs in top-view, the abdominal belt is clearly visible in side-view. Make sure no small children come near the raw food. 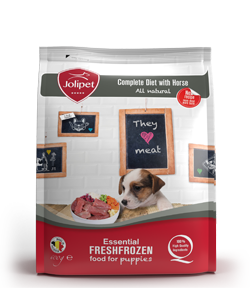 Jolipet Horse Puppy tastes nice cold (fully thawed in the refrigerator or microwave) or reheated (in microwave or pan). Fully defrost in the refrigerator. Typically defrosting takes 12 hours. In other words: take out of the freezer in the morning and place in the refrigerator in the evening to serve in the evening; take out of the freezer in the evening and place in the refrigerator to serve the next morning. Never defrost at room temperature. Fully defrost in the microwave. The length of time needed to defrost depends on the type of microwave oven and the quantity to be defrosted. Ideally, food is defrosted at low power (low wattage), as you would defrost meat. At 350 Watt it takes about 6 minutes to defrost 500 g.
Fry in a pan, as you would hamburgers. Before use mix the food and allow to cool (if warmed up). Always provide fresh drinking water. Never change food at once, but gradually increase the dose of the new food. 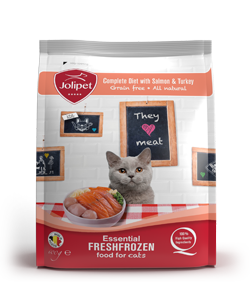 Fresh frozen food has the advantage of preserving the freshness of the nutrients for a long time. We assume a maximum storage period of 18 months at-18 ° c, after the day of production. Please see the best before date on the package. Thawed food has a 24-hour shelf life in the refrigerator. Never re-freeze defrosted food.